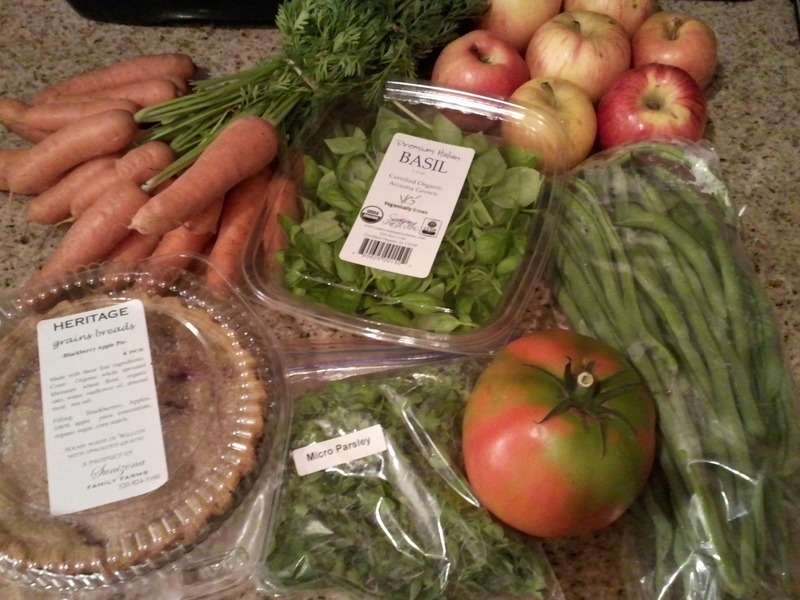 I got a bunch of carrots with greens, a blackberry apple pie, premium Italian basil, micro parsley, 2 lbs apples for juicing, a big ol’ beef tomato, and green beans. This week, I decided it was time to try the pie. I’ve heard good things about it from other participants here, and they were right! It’s very good pie. It’s not very big, but it’s worth it! I’m very excited to have green beans again, they are really good, especially cooked with garlic. I did make some apple pear juice with my juice extractor earlier this week that was a big hit with the kids, so they are excited to have more apples for juice. I still have leeks, so I will use some parsley for more Potato Leek Soup. I know I had a plan for the basil, but that’s escaping my mind at the moment, so if nothing else, I will make pesto! Note: I order a custom box and choose what I want in my box from their Web Store. There may be variances in availability on different pick up days.